Appearance: Among the largest terrestrial reptiles. Long neck. Robust limbs. Bony plates on carapace and forelimbs. Jaws with sharp edges for tearing vegetation. Carapace (upper shell): Variety of carapace shapes. Round "domed" type, flatter "saddleback" type with high anterior opening; some "intermediate" shapes also described. Sexual Dimorphism: Males have concave plastron (lower shell). Males up to 2-3 times larger than females. Size difference particularly pronounced in saddlebacked species. Range: Galápagos Islands, west of Ecuador. Habitat: Found in diverse habitats. Saddleback carapace types found on small, dry islands with low elevation and sparse resources. Domed carapace types and some saddleback carapace types found on larger, wetter islands with higher elevation areas, more resources, and more diversity of habitats. IUCN Status: All species at risk of extinction. See each species' risk level in Conservation Status. Locomotion: Slow walk, but may move substantial distances. Float well, but swim with difficulty. Activity Cycle: Most active during the day, but spend up to 16 hours resting. Spend active time foraging and walking between habitat areas. Immobile at night and exhibit sleep-like behaviors. Diet: Plants and fruits—grasses, shrubs, Opuntia cactus. Can go months without food or water (generate water internally by metabolizing stored fat). Drink large amounts of water, if available. The Galápagos Islands are named after these tortoises. Able to go months without food or water. Seafarers in 18-20th centuries took advantage of this—stored live Giant Galápagos Tortoises (GGTs) in hulls of ships as source of fresh meat. Overexploitation in the 1800s resulted in extinction of several species. Exhibit long periods of inactivity when conditions are harsh. Some individuals migrate with the seasons. As they walk, carve paths through vegetation; shape plant communities through walking and eating. Ongoing programs to eradicate invasive species that are detrimental to GGT reproduction and survival; GGTs being reintroduced to some Galápagos Islands. The San Diego Zoo received its first tortoises in 1928; some of these original tortoises still live at the Zoo today. First successful hatchings in 1958. For years, the San Diego Zoo had the only breeding colony in zoos, worldwide. In 1977, as one of only 15 breeding individuals left, "Diego," a male Española Giant Tortoise, was sent back to the Galápagos to participate in a captive breeding program. 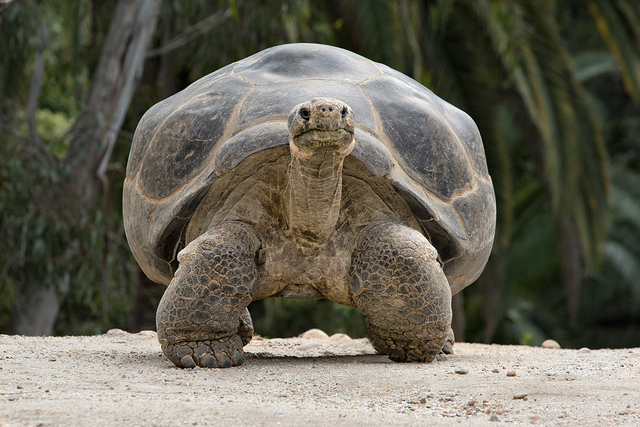 Abbreviations: GGT(s) is used as an abbreviation for Giant Galápagos Tortoise(s), throughout. How to cite: Galapagos Tortoises (Chelonoidis spp.) Fact Sheet. c2017. San Diego (CA): San Diego Zoo Global; [accessed YYYY Mmm dd]. http://ielc.libguides.com/sdzg/factsheets/ galapagostortoises. Thank you to Kim Lovich, Curator of Herpetology & Ichthyology for San Diego Zoo Global, for providing expert content review of this fact sheet. Many thanks to Dr. Linda Cayot, Galapagos Conservancy's Science Advisor, for providing key information on GGT taxonomy, population estimates, nesting biology, and morphometrics. Thank you to Jonny Carlson, Reptile Keeper at the San Diego Zoo, for providing a wealth of information on GGT husbandry practices. We appreciate his knowledge of animal care and passion for reptiles. Dr. Elizabeth A. Hunter kindly responded to information requests regarding the biology and ecology of GGTs. Dr. Hunter conducted research on GGTs while earning her Master's degree. At the time of this writing, she is a postdoctoral researcher in ecology and conservation biology with the Department of Natural Resources and Environmental Science at the University of Nevada-Reno. Thank you to Lisa Bissi, Photo Archive Librarian with San Diego Zoo Global, for providing many of the historic photographs used in this fact sheet.